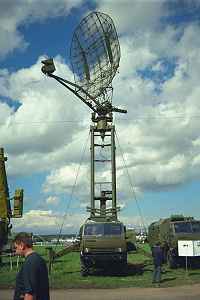 The “Casta 2E2” (Russian designators “39N6” - cyrillic: “39Н6”, or “Kasta 2-2”) is a medium-range 2D air surveillance radar in the low-altitude range. It is designed to efficiently acquire air targets in conditions of intensive clutter reflections from a background surface, local objects and weather formations. It performs automatic detection, range/azimuth/altitude measurements as well as “friend or foe” identification of various aerial targets such as aircraft, low speed and hovering helicopters, remotely-piloted vehicles and cruise missiles, including those flying at low and very low altitudes. Due to superior performance the radar is capable of acquiring “stealth-technology” air targets as well as moving objects at sea.